While there is no one to deliver me. So will my honour in the dust be found. Against the rage of all who me oppose. For all assembled nations gathered round. Your justice to the peoples, LORD, apply. Look, O Most High, on my integrity. And be the righteous one’s secure defence. Who saves the upright when to him they cry. And every day his wrath God will declare. From which his fiery arrows forth will go. Gives birth to lies and no reward receives. Then falls into the very pit he made. His evil will descend upon his head. I’ll praise the LORD Most High; his name I’ll bless. This works well to the tune Slane which you can hear here or to Eventide which you can hear here Both are recordings of congregations singing the Psalm. I write this as I prepare to leave Manchester – my home for the last 20 years – to take up a new ministry in Glasgow. Leaving is bitter-sweet. There are many good memories of Manchester and many friends here who have been important parts of my journey over the years. Some of these friends are those who have fled to the UK to find sanctuary and many of these are Muslims who have found a freedom here than they would ever have found at home. I write just a few days after the devastating bomb which killed and maimed children and adults leaving a pop concert. People around the world have been appalled and I have been amazed at the outpouring of grief, friendship and a sense of unity in the last week in Manchester. My Muslim friends are as devastated as my Christian and non-religious friends and the desire to do something to mark this tragedy has led to a plethora of vigils and a huge shrine in a square in the city centre where flowers have been left and prayers said. 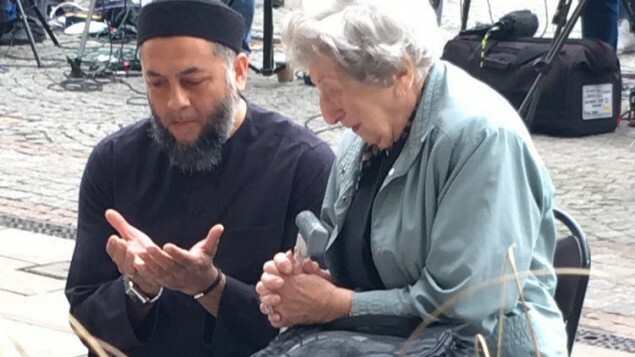 One of the most powerful images was of a Jewish woman praying together with a Muslim man at this makeshift shrine; something which should not be extraordinary at all has touched so many of us. Our Psalm today – both suggested tunes for it work incredibly well – reminds us that in God we find our refuge. The first lines are especially pertinent as we think of those for whom, at the Manchester Arena, there was no one to deliver them from the evil that tore into them. As the people of Manchester have processed this dreadful event we have found ourselves seeking to bridge divides, work across cultural and religious difference and show that hatred, violence and evil are never the last word. The “I love Manchester” signs going up everywhere serve as icons of the idea that love trumps hate. Even in our darkest hour God is to be found in the love rising up over the hate. The Rev’d Andy Braunston is a minister in the Synod of Scotland’s Southside Cluster and coordinator of the Daily Devotions Project. (C) Psalmody and Praise Committee, Free Church of Scotland, 15 North Bank Street, Edinburgh, EH1 2LS.